There are many specialized tools required, then there are those "nice to have" items. I have to tell you though, nice to have comes close to being required after a while. For example... and air drill is not required, until you hold the weight of an electric or cordless for 2 hours drilling 400 holes for rivets. The air drill is $29.00 from home depot and is 1/5 the weight of an electric. Doesn't take too long to get into my required list, about 15 minutes worth of drilling and I was off to home depot for my air drill. rivet sets for gun (1/8", 3/16", flush swivel , back-rivet set) I bought a complete set including angle sets, but never used them. With that being said, lets go into some other tools that are not required but are "nice to have", then, if your like me, become required as time goes on. 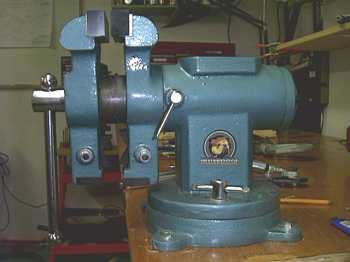 Bench grinder (for polishing wheel and grinding wheel) 6"
Compressor ($389 home depot.) DO NOT get the oilless type. You'll be deaf before you get to the wings) 30 Gallon 6hp will do the trick. Especially if your painting your own plane. Might as well get it early, you'll be glad you did. C-clamps, twelve 2", twelve 3", two 5", and get 2 of those quick clamp things from home depot. Allows a quick release and clamping of anything. I use these every day. The C-Frame dimpler below is used to create dimples in sheet metal for counter sink rivets. The metal frame you see sticking out is the dimpler. Around it is a 4'x3' bench top gismo used to keep your material at the level of the dimpler. My dimpler is from Cleveland tools and came with plans for the wooden frame, carpet top, bench top unit you see below. It took 20 min. to build and is the best gismo I have to date. Makes dimpling much easier and your holes are consistent every time. (Also if you plan on building your own wing spars, as I did, you can use this tool as well. See the wing spar section for details). You slide the sheet metal under the frame, align your hole with the dimple die, and hit the top with a hammer and bango, you have a perfect dimple in your sheet metal. I gave you a picture of the underside below and right. It is a 3/4" x 3 1/4 " frame with a 3/8 plywood top. Why a 3/4" wide wooden frame? Well because you can't buy lumber in that width of course!!! I ripped a 2x4 in my handy band saw and got the width required in the plans. After building it I found a 2x4 frame would have worked just fine, but would be a bit heavier. DO NOT follow the plans from Cleveland. They are wrong!!! Notice the 2 cross members between the c-frame on the picture showing the underneath view? The plans say 6" spacing, but the c-frame is 4" wide. This allows for 1" movement from side to side of the c-frame. When you hit the shaft with the hammer, it moves around causing you misery. Use a 4" spacing of the cross members and your c-frame will not move around on you. I have found that having close quarters for tools is very advantageous. It keeps me from running around the garage doing stuff. Things are close, easy to get to etc. 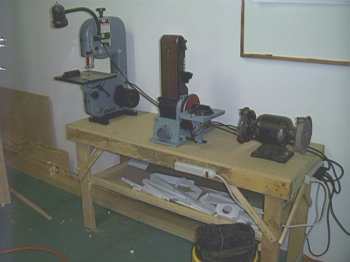 Below is my "workstation" with band saw, sanding station and bench grinder. I am using this constantly. Plus it is another place to lay things on. You cant have enough places to throw things on. 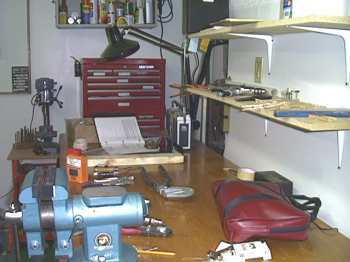 My main work area, a solid core door as a bench top, shelves above and below, moving light for detailed work, radio, and my rolling tool chest and drill press is where I spend 90% of my time. I cant emphasize enough, keep stuff close by. Remember I am doing this in 1/2 of a 2 car garage. I think my best store bought, "best buy" item was this vise below. Bought from Sam's Club for 50$. 30$ cheaper than anything comparable at Home Depot and more features. It swivels horizontally and vertically. 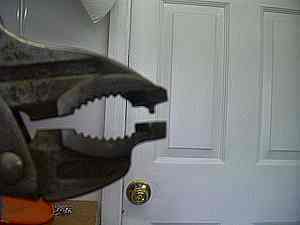 Has a flat banging area, plastic inserts for the teeth grip area, a pipe grabber, and a 90deg. bending thingy that I have used several times all ready to bend aluminum to 90deg. angles. Not to mention this is very heavy duty. I have beet things silly in this vise with no adverse affects. It has a "bulldog" label on the side.